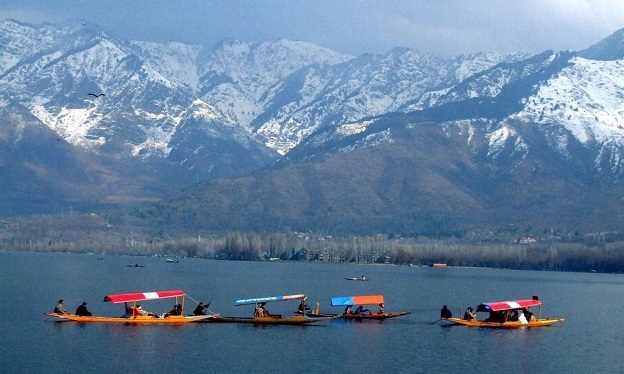 Dal is a lake in Srinagar, the summer capital of Jammu and Kashmir. The urban lake, which is the second largest in the state, is integral to tourism and recreation in Kashmir and is named the "Jewel in the crown of Kashmir" or "Srinagar's Jewel". The lake is also an important source for commercial operations in fishing and water plant harvesting. The shore line of the lake, is about 15.5 kilometres (9.6 mi), is encompassed by a boulevard lined with Mughal era gardens, parks, houseboats and hotels. 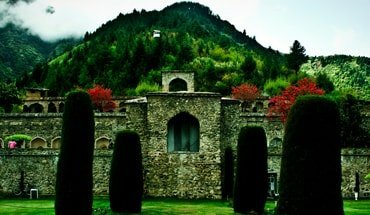 Scenic views of the lake can be witnessed from the shore line Mughal gardens, such as Shalimar Bagh and Nishat Bagh built during the reign of Mughal Emperor Jahangir and from houseboats cruising along the lake in the colourful shikaras. During the winter season, the temperature sometimes reaches ?11 �C (12 �F), freezing the lake. The lake covers an area of 18 square kilometres (6.9 sq mi) and is part of a natural wetland which covers 21.1 square kilometres (8.1 sq mi), including its floating gardens. The floating gardens, known as "Rad" in Kashmiri, blossom with lotus flowers during July and August. The wetland is divided by causeways into four basins; Gagribal, Lokut Dal, Bod Dal and Nagin (although Nagin is also considered as an independent lake). Lokut-dal and Bod-dal each have an island in the centre, known as Rup Lank (or Char Chinari) and Sona Lank respectively. 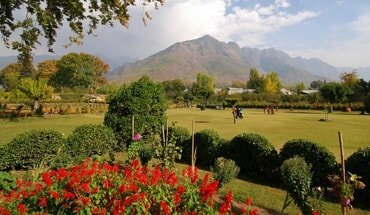 At present, the Dal and its Mughal gardens, Shalimar Bagh and the Nishat Bagh on its periphery are undergoing intensive restoration measures to fully address the serious eutrophication problems experienced by the lake. Massive investments of approximately US$275 million (? 11 billion) are being made by the Government of India to restore the lake to its original splendour.